Complete H-alpha solar telescope with 60mm aperture and additional 60mm double-stack filter system. The telescope can be used with <0.7 Angstrom bandwidth or with <0.5 Angstrom bandwidth, both at the full aperture of 60mm! With advanced air-pressure tuning system, B600 blocking-filter, and Crayford focuser. 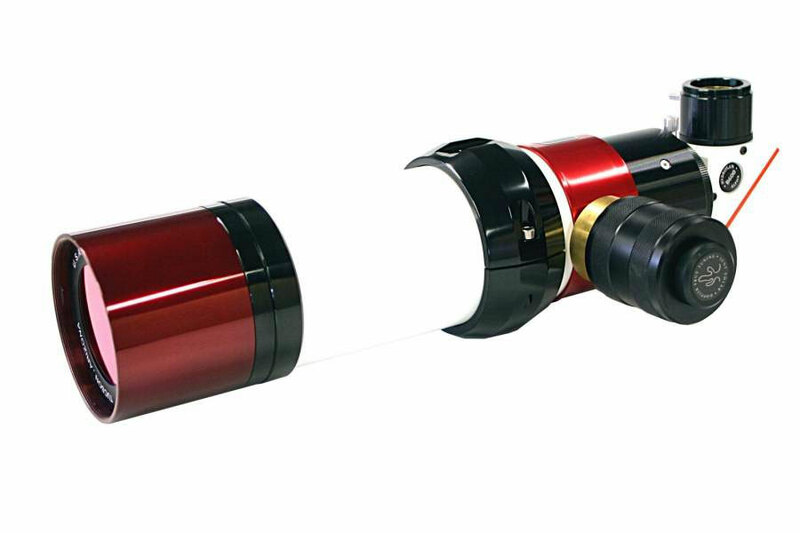 This telescope will be delivered with two matched Etalons, a internal Etalon and a external. The LS60THaDS60 could be used only with the internal H-alpha filter at <0.7 Angstrom, or together with the front mounted external H-alpha filter at <0.5 Angstrom bandwidth, at a free aperture of 60mm. By reducing the bandwidth from estimated 0.7 Angstrom to 0.5 Angstrom more details on the solar surface will become visible. Adding a second Etalon to an existing Etalon is not quite as simple as it may seem. Both Etalons need to be brought on line (matched) and both need to be adjustable (Tuning) such that all ghosts images could be eliminated. Ideally the transmission curves should overlap perfectly when on band to provide for the best possible resolution and contrast. Both etalons in this system will be matched at the factory in order to provide a system that is both optimized for performance and the elimination of ghosting. The internal Etalon of the telescope is equipped with the advanced air-pressure tuning system “Pressure-Tuner”. The Etalon of the external double-stack filter is provided with mechanical tilt-tuning system. Παρακαλώ ενημερώστε με για την τιμή του προϊόντος LUNT SOLAR TELESCOPE LS60THADS60/B600CPT H-ALPHA, με κωδικό: OPT-0551263.